Mike London came into Saturday on the hot seat. What his UVA football team showed in a 28-20 loss to seventh-ranked UCLA seems to indicate that he will keep his job at the end of the year. Virginia has talent, particularly on defense, which stifled Bruins quarterback Brett Hundley into a 20-for-33, 242-yard performance while sacking Hundley, a preseason Heisman Trophy favorite, five times, forcing two fumbles. The high-octane UCLA offense, which we last saw in the Sun Bowl pasting Virginia Tech, managed just one scoring drive in its 16 drives for the day. The problems for London and his staff are on the other side of the ball. 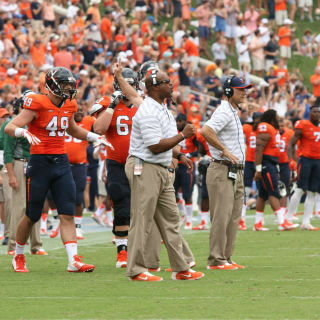 After spending the spring, summer and training camp pushing Greyson Lambert as the solution to his program’s longstanding quarterback problems, the sophomore didn’t make it to halftime in his first start before being benched for third-stringer Matt Johns, who led three scoring drives in bringing the ‘Hoos back from a 21-3 deficit to the brink of an unthinkable upset. Unthinkable, anyway, to practically everybody outside of a small circle in Bryant Hall. UCLA was a 21-point favorite coming in, and a resounding victory in a tuneup for a playoff contender seemed all but foretold. What happened was not that at all, and indeed, UVA lost this one, as opposed to UCLA winning it. Three Bruins defensive touchdowns were the difference, and yes, a team getting three defensive touchdowns is pretty much the definition of an outlier. My pregame prediction, made last week, was a 24-20 Virginia victory, and this game played like a Virginia victory that was more like 20-7. My call wasn’t a guess; there is talent on the roster, an accumulation from four pretty good recruiting classes brought in by London and his staff, which on paper is the fourth-best group of talent from the Rivals.com and 247Sports.com recruiting rankings over the past four years in the ACC. An analysis of recruiting numbers up and down rosters of the Cavs and Bruins had this one tight. Looking ahead, Virginia has more accumulated talent than nine of its remaining 11 opponents (everybody but Florida State and Miami). Which isn’t to say that Virginia will finish 9-3, but neither is this the overmatched team that people assumed they would see coming into the 2014 season, on the heels of a 2-10 record in 2013, and just three winning seasons in the last nine. This UVA team should win six, seven games, and it’s not inconceivable to see eight, if you look at what the Cavs were able to do on Saturday in putting a major scare into a national-title contender even when giving the favorites three fluke defensive touchdowns. London still has his critics (me among them) for questionable decisions in key situations, like the one late in the fourth in going for a fourth-and-long down eight with a chip-shot field goal for the reliable Ian Frye that could have put some interesting late-game pressure on UCLA. The game plan on offense from London and offensive coordinator Steve Fairchild also has fans rankled, though it could be argued that the offense, which is nowhere near as good as the defense at this stage, could benefit from a conservative approach as it tries to find its identity. The focus now turns to Richmond, which brings in a pair of Virginia castoffs at quarterback, Michael Rocco and Michael Strauss, who no doubt will return to Scott Stadium with huge chips on their shoulders. The Richmond game is a classic trap game, with the ACC opener against Louisville on Sept. 13 looming. Beat Richmond, beat Louisville, and this season could be interesting for UVA fans. Actually, it’s already a lot more interesting than anybody assumed it would be 24 hours ago. The idea that London would be on anything other than an even hotter seat was unthinkable until Saturday afternoon. Now it’s hard to imagine him not turning this around this year to a point where any talk of his future job status is rendered moot.